We offer best quality of plastic crockery. - Utilised extensively in the food & beverage industry. Plastic Disposable Crockery available in branded and non-branded in all standard industry sizes and specifications. Can be customised to aircraft colours and branding. Also in disposable. Owing to our rich industrial experience, we are offering Disposable Plastic Crockery, which is manufactured using food grade material and other raw material for maintaining the hygiene. These containers offered by us are available in various colors & sizes and are also available at market leading prices. 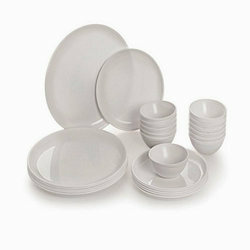 We are one of the manufacturers and suppliers of a wide Plastic Crockery.